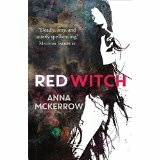 Anna McKerrow works on arts projects for the reading charity Book Trust, which is where she became interested in Young Adult fiction. (It wasn’t around when she was 15; she went straight from Judy Blume to Jackie Collins.) She has also published four volumes of poetry and taught creative writing in adult education for 7 years. She provides school workshop and book-event consultancy to writers and publishers. Anna is a Pagan, reads the tarot, is a Reiki practitioner, and is a little bit obsessed with stone circles. She believes passionately, like Alan Moore, that creative activities such as writing are a kind of magic in themselves. Find Anna on Twitter @AnnaMcKerrow and on her website. 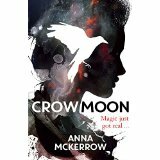 Crow Moon (sequel Red Witch): Danny is a fun-loving 16-year-old looking for a father figure and falling in love with a different girl every day. He certainly doesn’t want to follow in his mum’s witchy footsteps. Just as his community is being threatened by gangs intent on finding a lucrative power source to sell to the world, Danny discovers he is stunningly powerful. And when he falls for Saba, a gorgeous but capricious girl sorceress, he thinks maybe the witch thing might not be such a bad idea. But what cost will Danny pay as, with his community on the brink of war, he finds that love and sorcery are more dangerous than he ever imagined?